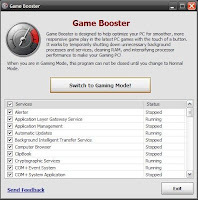 The Game Booster application was designed to help optimize your PC for smoother, more responsive game play in the latest PC games with the touch of a button. Game Booster helps achieve the performance edge previously only available to highly technical enthusiasts. It works by temporarily shutting down background processes, cleaning RAM, and intensifying processor performance. That means you can keep all the features of Microsoft Windows Vista and XP ready for when you need them, but turn them off when you are ready to get down to serious business gaming. Game Booster makes it simpler to enjoy the latest games and take your experience to a new level. All systems go!